이 순간 주시는 하나님 말씀: 김병원 목사님께서 제공하신 성도들이 꼭 암기해야 할 성구 220개 중에서 한 성구가 임의적으로 선택되어 보입니다. Reload 버튼을 누르면 계속 새 말씀을 보실 수 있습니다. A God's word at this moment: One of 220 key Bible verses, which were provided by Rev. Byung-Won Kim, will be randomly selected and popped up. You can keep renewing it by clicking 'Reload' button. 결과물이 없으면 아래 "주의 사항"을 참조하세요. 위에서 보고 싶은 성경을 클릭하고 (복수 가능), 빈 칸에 검색하고자 하는 단어를 한국어, 영어, 일본어, 히브리어, 헬라어 등으로 입력한 후, "결과 보기"를 클릭하십시오. 결과는 새로운 창에서 보이기 때문에 팝업을 허용해야 합니다. 밑의 "주의 사항"에서 다양한 입력 요령을 다룹니다. Please type any Korean, English, Japanese, Hebrew and/or Greek words in the blank box above, and click "Show me the result" button. Pop-up should be allowed for a new result window. "Notice" below deals with how to enter key words in various ways. 띄어쓰기나 '+'기호에 따라 두 단어 이상을 입력하면, 순서에 상관 없이 해당 입력어를 모두 갖는 성경 구절이 검색됩니다. 정확한 표현을 찾을 때는, "여호와 하나님"처럼 양쪽에 따옴표를 붙이십시오. 살롬을 입력하면, 압살롬도 검색됩니다. 이를 피하려면, " 살롬"처럼 '따옴표+빈칸+검색어+따옴표'의 형태로 입력하시면 됩니다. 어떤 낱말은 여러 의미를 갖는 경우가 있는 데, 한국어와 해당되는 영어 단어를 함께 입력하면, 필요없는 구절들을 제할 수 있습니다. If you type more than one word using a blank space or a '+' sign, all Bible verses containing all the given key words are selected regardless of the order of the key words. If you want to search for an exact expression, type it between double quotation marks as shown in "the LORD God". Some words have more than one meaning. In order to avoid to search unnecessary versers, you can enter both an English word and its corresponding Korean word. If no verses are selected, please try again checking spelling or space. '성검'은 원래 '성경 검색'의 준말이지만 다른 한자어로 '거룩한 칼'이란 의미가 있습니다. 에베소서 6장 17절에 성령의 검을 하나님의 말씀이라고 했으므로, 하나님의 말씀인 성경 자체가 '거룩한 칼' 곧 '성검'이라 할 수 있습니다. 이런 이유로 본 성경 검색 혹은 성경 찾기 프로그램의 이름을 '성검(聖劒, Holy Sword)'으로 정했습니다. 'Sung-Kum' is a shortened form of 'Sung_Kyung (Holy Bible) Kum_Saek (Search)', but it can mean 'Holy Sword' as well in different Chinese characters. 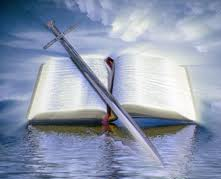 Since the sword of the Spirit is said to be the word of God In Ephesians 6:17, the Holy Bible, which is the God's word, can be said to be the 'Holy Sword (Sung_Kum)'. This is why this program is named 'Sung_Kum, i.e., 'Holy Sword'. 검색어가 한국어 및 영어 성경 어떤 책 몇 장 몇 절에 있는지 쉽게 찾아볼 수 있게 하기 위함입니다. This program is developed to help search Korean or English target words in the Bible easily. 검색어가 들어 있는 성경 구절을 한국어와 영어로 나란히 볼 수 있어서, 어떤 단어가 다른 언어에서는 얼마나 다양한 말로 번역되는지 볼 수 있습니다. 두 영어 버전 (version) 성경을 통해, 같은 언어라 할지라도 다른 버전에서는 얼마나 비슷하게 혹은 다르게 번역되는지 볼 수 있어 해당 말씀에 대한 이해도를 높일 수 있습니다. 검색어는 빨간색으로 표시되므로 금방 눈에 띕니다. 한국어의 많은 단어가 두 개 이상의 의미를 갖는데, 영어 단어와 함께 검색하는 것이 가능해서 필요한 결과만 얻는데 도움이 됩니다. Since the Bible verses containing the searching word appear together both in Korean and in English, you can see how many different ways word in a language can be translated into the other language. Since you can see how much similar or different a verse can be in two versions of English Bibles, it is of help for you to understand the verse more deeply. The searching word or phrase is expressed in red for distinction. 한국어의 불규칙 용언 처리 (Treatment of Korean irregular predicates): 한국어에는 많은 불규칙 용언(형용사 및 동사)이 있고 최소 의미 단위인 '의미소 (morpheme)'가 음절보다 더 작은 자음 하나인 경우도 있어 찾고자 하는 모든 정보를 얻지 못하는 경우가 많습니다. 예를들어, '아름답다'라는 말은 아름답고, 아름답기에, 아름다운, 아름다울, 아름다와, 등등 굉장히 많이 있는데, 적어도 '아름답'과 '아름다'를 따로 입력해야 원하는 결과를 거의 얻을 수 있을 것입니다. 그래도 이것은 쉬운 경우이고, '잇다'라는 말이 들어 있는 절을 찾기 위해서는 '잇(고, 지)', '이은', '이을', '이어' 등등 훨씬 많은 낱말을 따로 입력해야 되는데, 더군다나 '잇사갈', '잇대', '아들이어든', '매이어' 등과 같이 원하지 않는 결과까지 얻게 됩니다. 아직까지는 한국어의 용언 검색을 제대로 하는 검색 엔진을 보지 못해서 한 번 도전해 보고자 합니다. 혹시, 한국어 용언 검색을 잘하는 프로그램을 아시는 분은 연락해 주시면 대단히 감사하겠습니다. 검색어에 해당하는 말 표시 (Marking the corresponding word/phrase to the input one in green): 한국어 개역개정판 성경에는 '할렐루야'가 27개 절에 나오지만, NIV 성경에는 'Hallelujah'가 4개 절에 나오고, KJV 성경에는 'Alleluia'가 4개 절에 나올 뿐입니다. 'Praise the LORD'라고 번역한 결과입니다. 한국어를 검색할 때, 해당되는 영어 성경이 함께 나오는데, 검색어에 해당하는 영어 단어나 구절이 녹색으로 표시된다면, 또 반대로 영어 단어를 검색할 때 해당되는 한국어 단어가 녹색으로 표시된다면 훨씬 유용할 것입니다. 자동번역 시스템에 비하면 훨씬 간단한 것이기는 하지만 만만치 않기 때문에 제대로 해결하려면 꽤 시간이 걸릴 것 같습니다. 거의 사전작업에 달려 있다고 하겠습니다. Treatment of Korean irregular predicates: It is very hard to search for Korean predicates (verbs or adjectives), because there are many irregular forms and some morphemes (the minimal meaning unit) consist of only one consonant such as /n/ (past modifier as in /kan saram/ 'a man who went' from /ka/ 'to go' or /l/ (future modifier as in /kal saram/ 'a man who will go'). 혹시 이 '성검' 프로그램에 대해서 문의나 건의할 사항이 있으면 아래 이메일로 연락주시기 바랍니다. If you have any questions or suggestions concerning this 'Holy Sword' program, please feel free to e-mail me. Copyright © 2007,2008,2009,2010,2011,2012 김혁근 (Hyouk-Keun Kim) (email: hkkim78@yahoo.com). All rights reserved.